I use this drill after I cover how to serve to zones with my volleyball team! 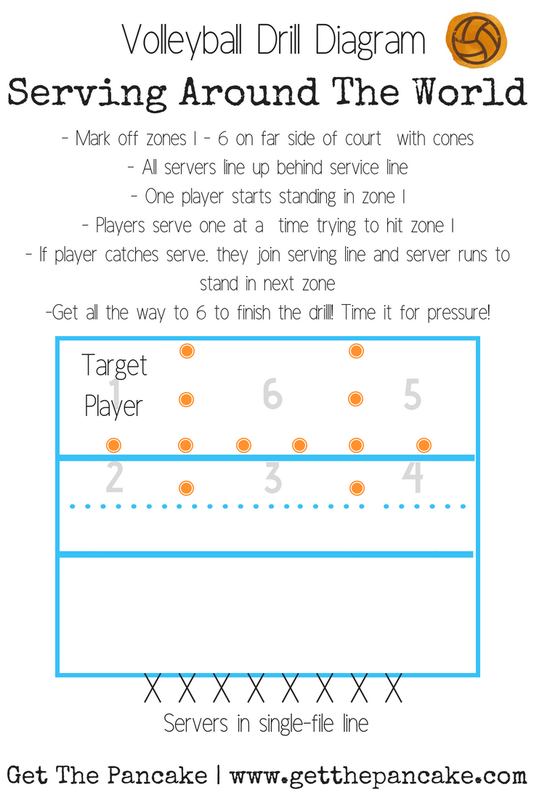 Easy serving game for your next practice! I use this drill for volleyball camps or clinics with younger teams in a less competitive way and focus on the fun of going all the way around! With older teams, I make it more challenging and competitive by having them play against each other. I'll also use this with my club teams when we've had a few serious practices and I know they need a bit of a mental break. The parameters of the drill make it productive, but they can let loose a little and laugh with each other while playing this game! Drills which help your team bond are ALWAYS important because a team who enjoys each other will play for each other. We're posting new content and drills all the time here on Get The Pancake, but we also have more content on YouTube, Instagram, Pinterest, and Facebook! Make sure to follow us there so you don't miss out on our latest content for volleyball coaches! Our goal is to bring you new content every week so you always have fresh ideas for your practices, clinics, camps, and private lessons! Let me know in the comments if you plan to use this drill and how old your team/group is!